Belvidere Park neighbor Joe Valles obtained an aerial photograph of the Belvidere Park neighborhood from Bill Clark, the owner of the car wash on Dennis Avenue. 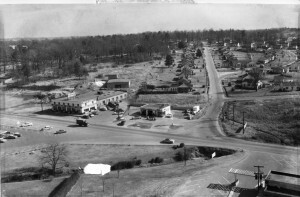 The picture was taken by Tom Oglesby from his plane in 1957. A long-time resident of Mordecai, Tom passed away last year. This entry was posted on Monday, May 9th, 2011 at 1:46 pm	and is filed under East CAC. You can follow any responses to this entry through the RSS 2.0 feed. Both comments and pings are currently closed.